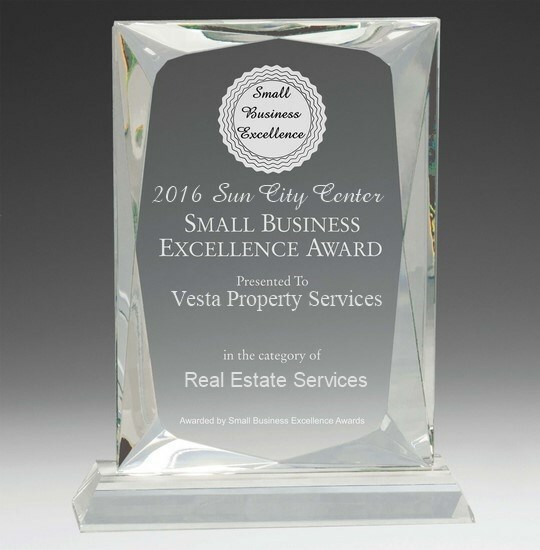 Vesta has received the 2016 Sun City Small Business Excellence Award. JACKSONVILLE, Fla. - Feb. 27, 2017 - PRLog -- Bob Stevens, President, Community Management, is pleased to announce that Vesta Property Services has received the "2016 Sun City Center Small Business Excellence" Award in the Real Estate Services' classification by the Sun City Center Small Business Excellence Award Program. "We are thrilled that our team is now a part of this exclusive group of small businesses that have achieved this selection," said Bob Stevens. "We are humbled and proud to have our hard work, innovation and creativity recognized," he added. Various sources of information were gathered and analyzed to select the winners in each category. The Sun City Center Small Business Excellence Awards recognize outstanding small businesses that serve their local market. Each year, the selection committee identifies companies that they believe have achieved outstanding marketing success in their local community and business category. These are small businesses that enhance the positive image of small businesses through service to their customers and community. Winners are determined based on the information gathered both internally by the Sun City Center Small Business Excellence Award Program and data provided by third parties. Vesta Property Services provides financing, management and ancillary services to developers of planned unit communities and resident associations in connection with clubhouses, golf courses and other amenity and infrastructure facilities and commercial real estate management. The company is headquartered in Jacksonville, Fla. with offices strategically located throughout Florida. They have nearly 1,000 associates providing a wide spectrum of services to more than 150,000 residents, tenants, and unit owners. To learn more about the company's HOA and community management solutions, visit www.vestapropertyservices.com.